دهقان, زهره, مدرس, امیر. (1396). ارزیابی رفتار خستگی مخلوط آسفالت گرم حاوی الیاف پلی اتیلن بازیافتی به روش خمش چهار نقطه‌ای. فصلنامه علمی - پژوهشی مهندسی حمل و نقل, 9(ویژه نامه روسازی), 143-158. زهره دهقان; امیر مدرس. "ارزیابی رفتار خستگی مخلوط آسفالت گرم حاوی الیاف پلی اتیلن بازیافتی به روش خمش چهار نقطه‌ای". فصلنامه علمی - پژوهشی مهندسی حمل و نقل, 9, ویژه نامه روسازی, 1396, 143-158. دهقان, زهره, مدرس, امیر. (1396). 'ارزیابی رفتار خستگی مخلوط آسفالت گرم حاوی الیاف پلی اتیلن بازیافتی به روش خمش چهار نقطه‌ای', فصلنامه علمی - پژوهشی مهندسی حمل و نقل, 9(ویژه نامه روسازی), pp. 143-158. دهقان, زهره, مدرس, امیر. ارزیابی رفتار خستگی مخلوط آسفالت گرم حاوی الیاف پلی اتیلن بازیافتی به روش خمش چهار نقطه‌ای. فصلنامه علمی - پژوهشی مهندسی حمل و نقل, 1396; 9(ویژه نامه روسازی): 143-158. 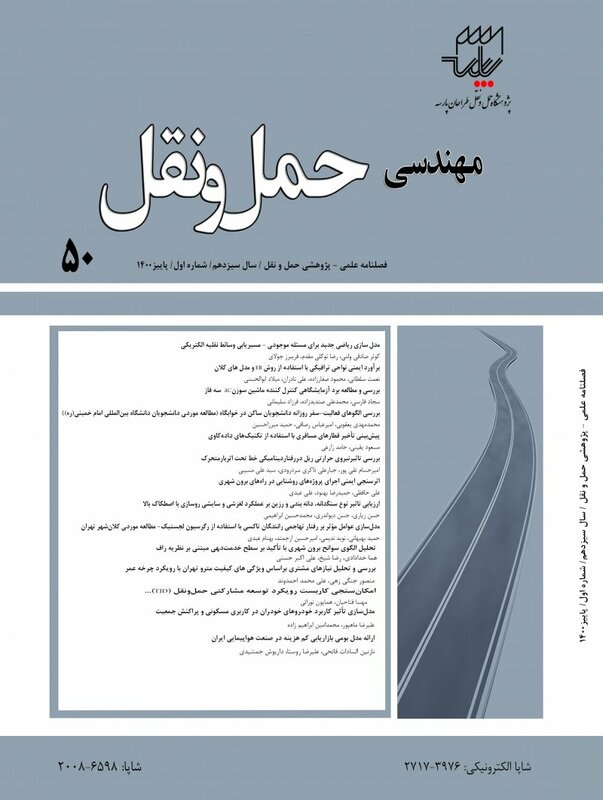 در تحقیق حاضر تاثیر استفاده از الیاف پلی‌اتیلن بازیافتی بر رفتار خستگی مخلوط آسفالتی گرم مورد بررسی قرار گرفت. مقدار الیاف برابر با 5/0، 0/1، 5/1 و 0/2 درصد وزن قیر و طول آنها یک و دو سانتیمتر انتخاب شد. همچنین تاثیرات خرده پلاستیک بازیافتی با اندازه 18/1-425/0 میلیمتر که در دو مقدار 0/1 و 0/2 درصد وزن قیر اضافه گردید ،با الیاف مورد مقایسه قرار گرفت. آزمایش خستگی به روش خمش چهارنقطه‌ایدر دمای 20 درجه سانتیگراد در سه سطح کرنش 300، 500 و 700 میکروکرنش انجام گرفت. براساس نتایج به دست آمده، سختی خمشی نمونه‌های حاوی هر دو افزودنی نسبت به نمونه شاهد کاهش یافت. همچنین این روند کاهشی با افزایش مقدار افزودنی‌ها ادامه داشت. عمر خستگی نمونه‌های حاوی الیاف برای تمام مقادیر ،بیشتر از نمونه شاهد بود. در کرنش 300 میکروکرنش، بیشترین افزایش عمر خستگی برای الیاف یک و دو سانتیمتری به ترتیب 49/1 و 77/1 برابر نمونه شاهد بود. همچنین در کرنش 700 میکروکرنش، این افزایش به ترتیب 38/1 و 63/1 برابر نمونه شاهد بوده‌است. تاثیرات خرده پلاستیک بازیافتی تا حد زیادی مشابه با الیاف بوده‌است. بیشترین مقدار افزایش عمر خستگی برای نمونه‌های حاوی خرده پلاستیک برای 0/1 و 0/2 درصداز این افزودنی به ترتیب 48/1 و 63/1 برابر نمونه شاهد بود. با توجه به تحلیل‌های انجام شده ،استفاده از 0/1 درصد وزن قیر الیاف دو سانتیمتری و 0/2 درصد وزن قیر خرده پلاستیک جهت تقویت رفتار خستگی مخلوط آسفالتی پیشنهاد می‌شود. -Abtahi, S. M., Ghorban Ebrahimi, M. and Kunt, M. M. (2011) “Production of polypropylene reinforced asphalt concrete mixtures based on dry procedure and superpave gyratory compactor”, Iranian Polymer Journal, Vol.20, No.10, pp.813-823. - Abtahi, S.M., Sheikhzadeh, M., Hejazi, S.M. (2010) “Fiber-reinforced asphalt concrete- A review”, Construction and Building Materials, Vol.24, pp.871-877. - Ahmadinia, E., Zargar, M, Karim, M. R., Mahrez, A. and Shafigh, P. (2011) “Using waste plastic bottles as additive for stone mastic asphalt”, Mater Design, Vol.32, pp.4844–4849. - Ahmadinia, E., Zargar, M., Rehan Karim, M. and Abdelaziz, M. (2012) “Performance evaluation of utilization of waste Polyethylene Terephthalate (PET) in stone mastic asphalt”, Construc Build Mater, Vol.36, pp.984–989. - Baghaee Moghaddam, T., RehanKarim , M. and Syammaun, T. (2012) “Dynamic properties of stone mastic asphalt mixtures containing waste plastic bottles”, Constr Build Mater, Vol.34, pp.236–242. - Baghaee Moghaddam, T., Soltani, M., Rehan Karim, M. (2013) “Evaluation of permanent deformation characteristics of unmodified and poly-ethylene terephthalate modified asphalt mixtures using dynamic creep test”, Materials and Design, Vol.53, pp.317–24. - EN 12697-24. (2004) “Bituminous mixtures-test methods for hot mix asphalt - part 24: resistance to fatigue”, European committee for standardization, July 2004. - Guo, Q., Li, L., Cheng, Y., Jiao, Y. and Xu, C. (2015) “Laboratory evaluation on performance of diatomite and glass fiber compound modified asphalt mixture”, Materials and Design, Vol.66, Part A, pp.51-59. - Herráiz, T.R., Real Herráiz, J. I., Domingo, L.M. and Domingo, F. C. (2016) “Posidonia oceanica used as a new natural fibre to enhance the performance of asphalt mixtures”, Construction and Building Materials, Vol.102, Part 1, pp.601-612. - Mahrez, A. and Karim, M. R. (2010) “Fatigue characteristics of stone mastic asphalt mix reinforced with fiber glass”, Int. J. Phys. Sci., Vol.5, No.12, pp.1840–7. - Majoryl, L. (1986) “Introductory textile science”, 5th ed. Holet, Rinehart and Winston Pub. - Mansourian, A., Razmi, A. and Razavi, M. (2016) “Evaluation of fracture resistance of warm mix asphalt containing jute fibers”, Construction and Building Materials, Vol.117, pp.37-46. - Modares, A. and Hamedi, H. (2014 (a)) “Effect of waste plastic bottles on the stiffness and fatigue properties of modified asphalt mixes”, Materials and Design, Vol.61, pp.8-15. - Modarres, A. and Hamedi, H. (2014 (b)) “Developing laboratory fatigue and resilient modulus models for modified asphalt mixes with waste plastic bottles (PET)”, Construction and Building Materials, Vol.68, pp.259-267. - Moghadas Nejad, F., Vadood, M. and Baeetabar, S. (2014) “Investigating the mechanical properties of carbon fibre-reinforced asphalt concrete”, Road Materials and Pavement Design, Vol.15, No.2, pp.465-475. - Nazmi, W.M., Abdul Rahman, W. and Abdul Wahab, A.F. (2013) “Green pavement using recycled polyethylene terephthalate (PET) as partial fine aggregate replacement in modified asphalt”, Proc Eng, Vol.53, pp.124–8. - NCHRP synthesis 475 (2015) “Fiber additives in asphalt mixtures”, Transportation Research Board, Washington D.C., USA. - Norambuena-Contreras, J., Gonzalez-Torre, I., Fernandez-Arnau, D. and Lopez-Riveros, C. (2016) “Mechanical damage evaluation of geosynthetics fibres used as anti-reflective cracking systems in asphalt pavements”, Construction and Building Materials, Vol.109, pp.47-54. - Shen, S., Airey, G.D., Carpenter, S. H., Huang, H. A. (2006) “Dissipated energy approach to fatigue evaluation”, Road Materials and Pavement Design, Vol. 7, No. 1, pp. 85–92. - Yuan, M.M., Zhang, X.N., Chen, W.Q., Zhang, SX. (2013) “Ratio of dissipated energy change –based failure criteria of asphalt mixtures”, Research Journal of Applied Sciences, Engineering and Technology, Vol. 6, No. 14, pp. 2514-2519. - Shiuh, J. and Kuei-Yi, L. (2005) “Mechanism and behavior of bitumen strength reinforcement using fibers”, J. Mater Sci, Vol.40, pp.87–95. Taherkhani, H. and Amini, H. (2016) “Investigating the properties of Nylon fiber reinforced asphalt concrete”, International Journal of Science and Engineering Investigations, Vol.5, No.48, pp.6-11. - Tapkin, S. (2008) “The effect of polypropylene fibers on asphalt performance”, Construction and Building Materials, Vol.43, No.6, pp.1065-1071. - Tayebali, A., Rowe, A. G. M. and Sousa, J. B. (2010) “Fatigue response of asphalt aggregate mixtures”, J. Assoc Asphalt Paving Technol, Vol.61, pp.333–60. - Xue, Y. and Qian, Z. (2016) “Development and performance evaluation of epoxy asphalt concrete modified with mineral fiber”, Construction and Building Materials, Vol.102, Part1, pp.378-383. - Zhang, C. C. and Najd, A. (2012) “Effects of glass fiber/grid reinforcement on the crack growth rate of an asphalt mix”, 7th RILEM International Conference on Cracking in Pavements, Volume 4 of the series RILEM Bookseries, pp.1145-1155.